Does your home have a potential electrical fire hazard? 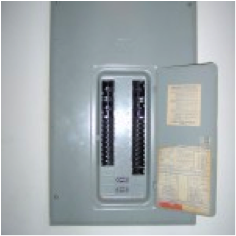 If your in Atlanta and your electrical panel box (Atlanta, GA) is a Federal Pacific Electric (FPE), most home inspectors and other experts recommend that it be replaced. We have recently replaced several FPE STAB LOK electrical panels in Atlanta, GA. If you reside or have a business in Jonesboro, College Park, Atlanta, Alpharetta, Milton, Marietta, Stone Mountain, Lithonia, Duluth, or Norcross, GA, chances are you may have an FPE panel box. FPE panels have been installed in commercial and residential buildings and should be changed by an electrician in Atlanta. The next time that you need an electrical panel replaced or just want to upgrade, call a licensed electrician who is licensed in the state of Georgia.